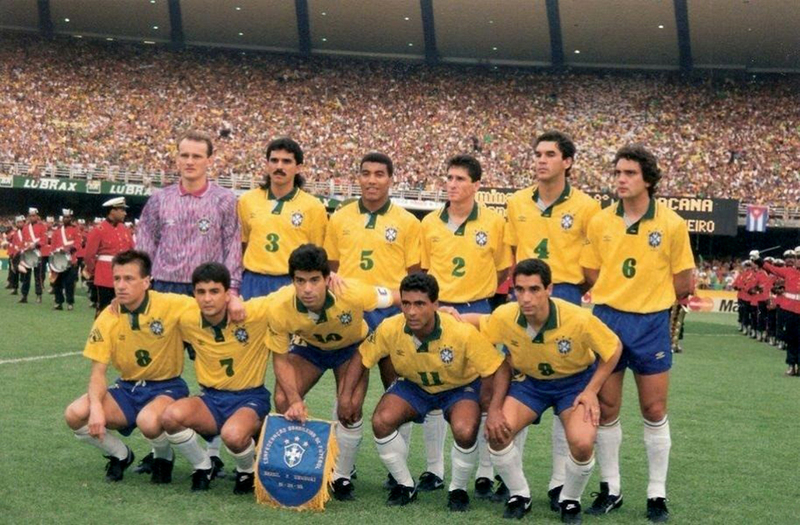 After finishing runners-up at that summer’s Copa America in Chile, Brazil introduced its new Umbro kit in a 3-1 win over Yugoslavia in October 1991. But these were the days before internet or even cable TV, and so my first close glimpse of the new shirt came in May 1992 when Brazil faced England at Wembley, a game I watched on the BBC. The match ended in a 1-1 draw, with goals from Bebeto and Platt, but was best remembered for Gary Lineker’s squandered penalty, an uncharacteristic miss which denied him the honour of equalling Bobby Charlton’s record tally of 49 goals for his country. My parents bought me the new Brazil shirt that Christmas. As was typical of the Umbro kits of the time, it featured an abstract “CBF” pattern on the sleeve that was echoed throughout the fabric. The shirt was essentially a yellow version of the Tottenham kit of the same period. I later bought myself a pair of blue Umbro shorts to further enhance the look when kicking a ball about at the park or in the garden. Two minor changes occurred to the kit between ’92 and ’93. The pattern at the top of the socks reverted to a traditional green and yellow stripe, while the classic English-style Umbro player numbers that had been used initially were replaced by an outsized poster typeface that was decidedly more South American (both Mexico and Argentine club Newell’s Old Boys sported similar numbers at the time). Brazil and England drew drew 1-1 again the following summer, this time at the RFK Stadium in Washington, D.C. The occasion was the US Cup, essentially a preparatory warm-up for the organizers of USA ’94. Brazil beat the hosts 2-0 at the Yale Bowl and drew 3-3 with world champions Germany, against whom veteran striker Careca scored his last international goal. Just eight days later Brazil were back in action opening their Copa América account in Ecuador. Carlos Alberto Parreira’s squad was made up almost exclusively of home-based players. This allowed young full-backs Cafú and Roberto Carlos a chance to impress, but it also meant the absence of experienced key men such as Jorginho, Branco, Bebeto and Raí, as well as PSV forward Romário. The striker had been not been called up to the national team since December, when he’d not hidden his frustration at travelling from Eindhoven to Porto Alegre for a friendly match only to be kept on the bench. In such circumstances, the team struggled in the first round. A goalless draw with Peru was followed by a 3-2 defeat to Chile. It was left to unproven talents Edmundo and Palhinha to engineer a 3-0 victory over Paraguay, a result which ensured qualification and briefly restored some optimism. In the quarter finals Brazil met their old foes Argentina, whose goalkeeper Sergio Goycoechea yet again proved decisive, saving Boiadeiro’s penalty in an epic shoot-out. 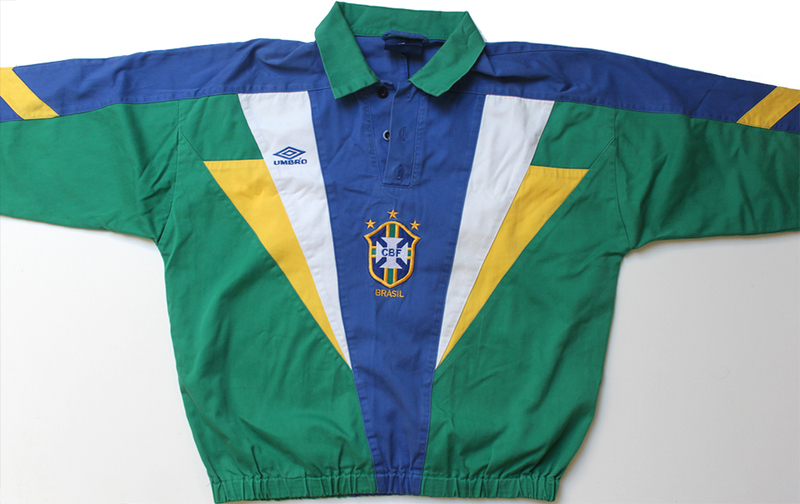 Later in 1993 I also obtained a rare training top as used by Brazil at that summer’s Copa América. Made of heavyweight cotton and featuring some lovely embroidery, it was the kind of thing that teams don’t seem to wear to train in anymore, and as a result now looks quite retro. The design certainly screams mid-nineties, but it made me the envy of several classmates during the 1993-94 school year. I recently rediscovered this special garment at my parents’ house back in England, where it has been perfectly preserved for the past twenty years. 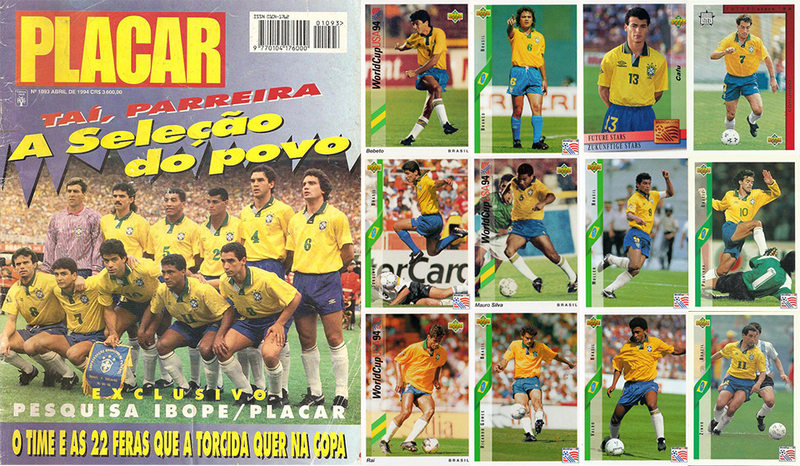 Brazil’s busy summer continued as a tightly scheduled qualification for the 1994 World Cup commenced. The team found it tough to shake off the Copa América disappointment, drawing 0-0 with Ecuador and losing 2-0 to Bolivia. A five-goal thrashing of Venezuela steered the Seleção back on course, and they ended their turbulent campaign with a spectacular run of results. In the space of two weeks they beat Ecuador, Bolivia and Venezuela, scoring twelve goals without reply. In their final qualification match Brazil needed a win against Uruguay at the Maracanã in order to finish top of the group and secure their ticket the USA. Under increasing pressure from fans and journalists, Parreira finally succumbed and recalled Romário, who had not featured in any of the qualifiers thus far. Back in this hometown stadium the Barcelona forward scored both goals in a 2-0 victory. When asked about his decision afterwards Parreira stated, “God sent Romário to the Maracanã.” Meanwhile, Copa América champions Argentina had faltered, conceding five goals at home to Colombia in Buenos Aires (a record home defeat) and eventually requiring an own goal in a last-gasp play-off with Australia to book their berth in the pot for the World Cup draw. Umbro unveiled a new Brazil shirt in time for the tournament in the United States, where as usual Brazil were counted among the favorites, though Parreira was quick to play down their chances. They couldn’t even count on the backing of Pele, who maintained that dark horses Colombia would lift the trophy. As it happened both were happy to be proven wrong. In the glistening sunshine of Pasadena Brazil became the first nation to win a fourth World Cup, a victory that put an end to a twenty-four year spell in the relative wilderness. 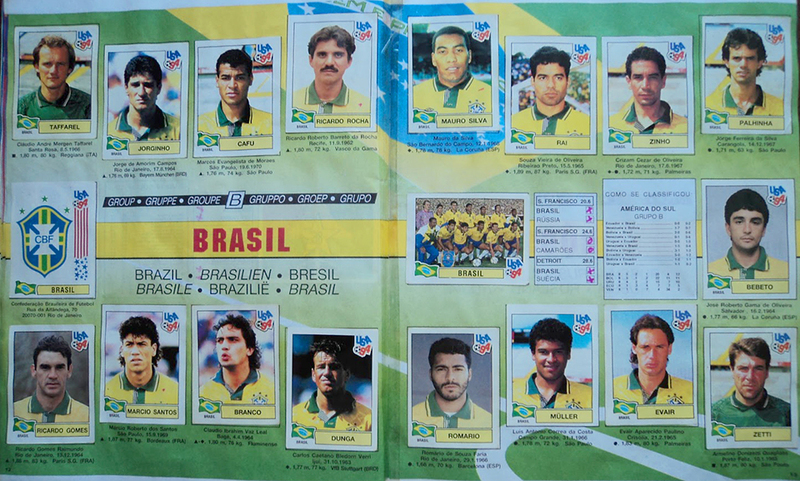 Though blessed with talent and a decisive cutting edge up front in the pairing of Bebeto and Romário, Parreira’s team was perhaps less flamboyant than previous Brazil sides. Some described them as excessively “European”, a harsh criticism perhaps given that the nucleus of the team had been based in Europe’s top leagues for years. 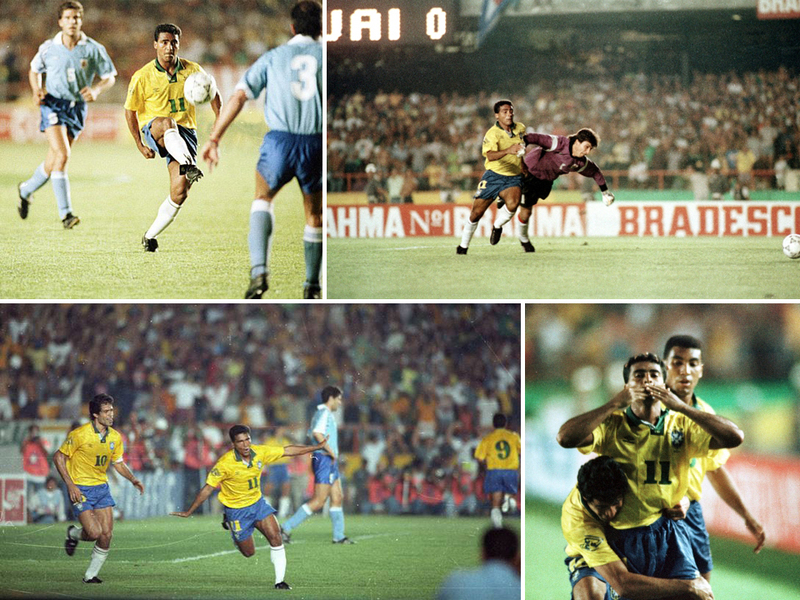 Romário emerged as one of the stars of the competition, but for the elegant number ten Raí it was a less positive World Cup. The Paris Saint-Germain midfielder had gone into the tournament as first-choice playmaker and captain, only to lose his place to Mazinho following the group stage. In the knock-out phase he was only used as a substitute, and missed out on the final altogether. Consequently, Dunga, who had taken over the armband, got to lift the trophy at the Rose Bowl. It seemed unfair that Raí was not offered the chance to share this honour, and his international career subsequently fizzled out. 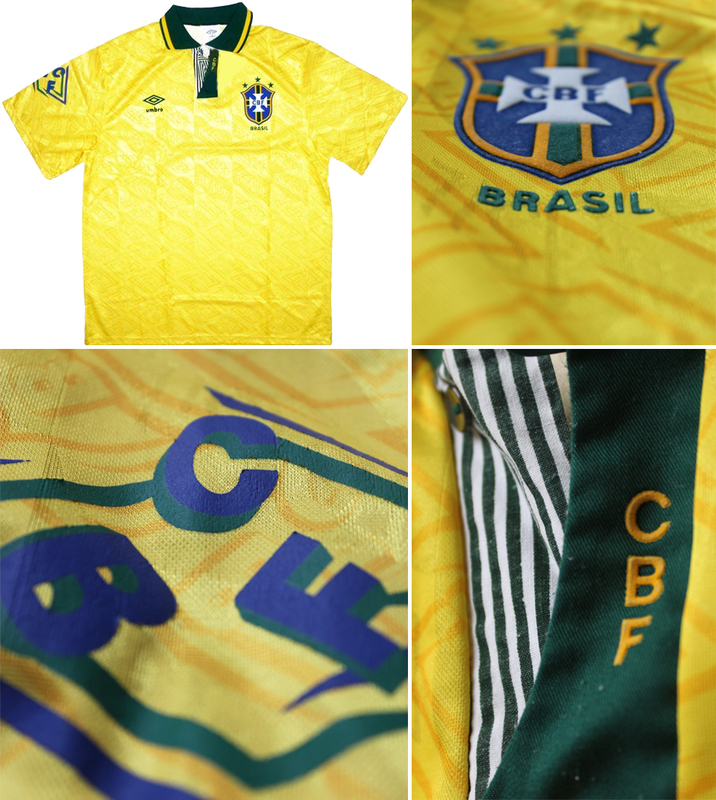 Brazil’s period with Umbro ended in the summer of 1997, when CBF launched its first kit manufactured by Nike, at the time still a marginal player in terms of soccer apparel. Every Brazil shirt for the last fifteen years has been emblazoned with the iconic swoosh device, instantly familiar to fans everywhere from Bangladesh to Belo Horizonte. The days of Topper and Umbro were long gone, and a global homogenization of football kits had begun.